Mumbai: Reliance Industries Ltd (RIL), India’s most valuable company by market capitalization, will give investors one free share for each held in the first such issue in 12 years. The Wednesday announcement, according to sector analysts, signals the management’s intent to appease stakeholders at a time when it’s fighting a pitched legal battle to retain rights and revenues from its biggest money spinning asset, the D6 gas block in the Krishna-Godavari (KG) basin. The Mukesh Ambani-controlled oil-to-yarn and retail firm last issued bonus shares, in the same 1:1 ratio, in 1997. The free-share issue also signals that with massive capital expenditure plans completed, it was time to reward holders of the stock. 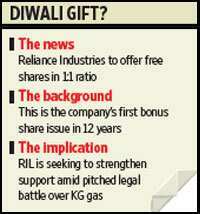 Besides the issue of free shares, RIL’s board has also proposed an interim dividend of Rs13 a share for 2008-09. The firm will spend Rs2,219 crore, inclusive of Rs322 crore taxes, for the dividend payout. The announcement was made after market hours. RIL’s shares closed 1.57% lower on the Bombay Stock Exchange on Wednesday at Rs2,099 apiece even as the bellwether equity index, the Sensex, fell 0.89% to close at 16,806.66. RIL’s global depository receipts (GDR) rose 1.15% to $90.96 on the Luxembourg Stock Exchange late Wednesday evening. The KG gas output, at peak levels, will be equal to 40% of India’s current hydrocarbon production and the new Jamnagar refinery along with the 660,000 barrels-a-day adjacent, existing RIL refinery, constitutes the biggest crude oil refining complex in one place in the world. “The management seems to be throwing in positive news and appeasing shareholders. It is good news for the share owners but nothing changes fundamentally in the company," said a Mumbai-based sector analyst with a foreign brokerage, who did not want to be named. Prayesh Jain, a research analyst with India Infoline Ltd, said sentiment had been weak around the RIL stock for quite some time and this will give shareholders a clear signal that staying invested in the company is rewarding. The management may be trying to neutralize the negative perception that came from the recent sale of treasury stocks, said Mumbai-based Amitabh Chakraborty, president, equity, Religare Securities Ltd. The mid-September sale of treasury stock worth Rs3,188 crore gave the perception that current share prices have reached a limit. RIL created the treasury stocks in 2002 when it merged back one of its subsidiaries. The “negative perception" could be coming from more than just the treasury stock sale as the refining and exploration firm battles with Reliance Natural Resources Ltd (RNRL), a firm owned by estranged brother Anil Ambani, in the Supreme Court over pricing of 28 million standard cu. m of gas a day for 17 years. The apex court will hear the case on 20 October in which RNRL is demanding the gas at 44% lower than government-specified prices, citing a family demerger pact in 2005. RIL has said that it cannot give gas without government approval and the corporate entity had not signed off on the informal family pact and it’s, hence, not binding on RIL. “He (Mukesh) needs retail investors behind him, while he fights a legal battle with his brother. It is also a signal to the market that RIL can double its equity capital and give a higher payout," said another analyst on condition of anonymity. According to the analyst, who has been tracking the firm for two decades, the move is an indicator that RIL’s huge capex involved in setting up the refinery and the commissioning of the KG gas basin is complete, and the time has come for the payoff to begin. RIL said it has “a strong balance sheet, large cash reserves and substantial financial flexibility owing to its treasury stock holding, which have a current value of nearly Rs40,000 crore". Alok Agarwal, RIL’s chief financial officer, said the additional shares will be given to RPL shareholders as well, who had received a share of RIL for every 16 held in RPL when the company announced the merger of its refining subsidiary in February this year. RIL’s audited accounts and the dividend announcement have come after the RIL-RPL merger waded through a bunch of shareholder objections that were overturned and finally approved by the high courts of Mumbai and Gujarat. The company had bonus share issues in 1980 and 1983, prior to the one in 1997. Bloomberg and Satish John contributed to this story.